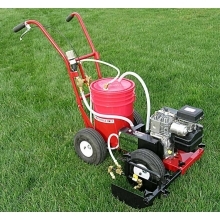 The Eco-Liner Plus is a battery powered field striping machine that features a heavy duty diaphragm pump that is powered by a 12-volt deep cycle battery. The Plus model includes a rapid charging 120V plug in battery charger. This time-saving addition adds to the performance and flexibility of the Eco-Liner. Additionally, the Plus features hand operated, handle mounted spray controls with quick release clamp that allows you to remove the spray gun for effortless painting of stencils with a 12' hose.This walk behind striper features dual handles with cushioned grips. You can quickly and easily paint professional quality lines for hours on a single battery charge. 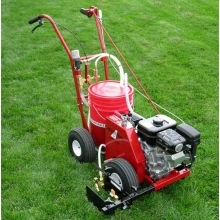 Now you can avoid the expensive maintenance of a gasoline engine or compressor. The Eco-Liner is proudly made in the USA with all welded steel construction and quality components giving you the trusted quality and durability that you deserve. 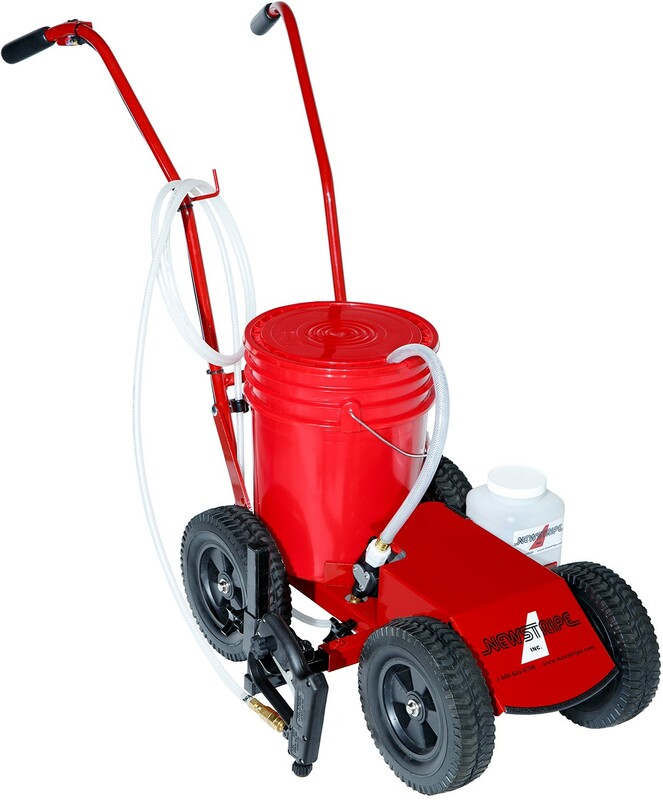 The machine is easy to use with no messy pouring, simply place a 5-gallon pail of premixed paint on the machine. Changing colors is fast and easy with the operator friendly design. There are no high pressure systems to work with making operation completely safe. When you're done, simply flush clean water through the spraying system and the machine is ready for your next field marking job. The efficient spray nozzle paints fields in half the time because there is no need to touch up or repaint for visibility. 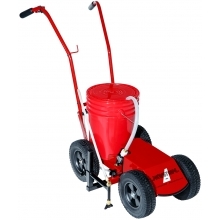 The line width is fully adjustable from 2"- 6" allowing for greater flexibility. The four no-flat tires never need inflating and have a knobby tread that can meet the demands of any terrain. The intake hose has a large mesh filter and features an additional inline filter with check valve to eliminate clogged tips and messy dripping. The filters and tips can be easily cleaned in under 30 seconds. An onboard clean water reservoir allows you to clean on-site.